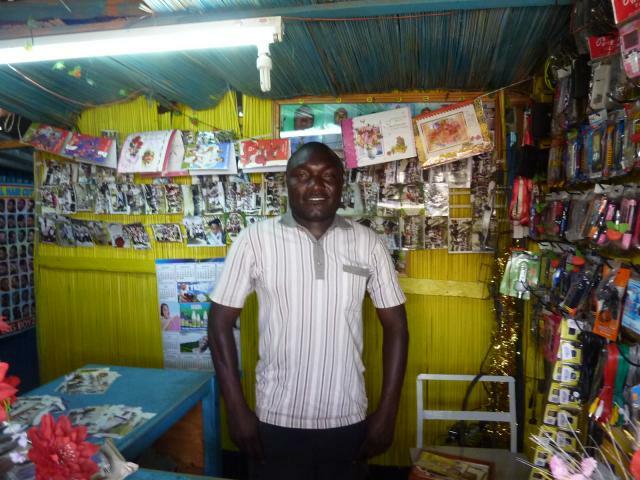 Today I visited Melchzedeck at his business in the town of Salgaa, 30 kilometers west of Nakuru. Three years ago Melchzedeck was working on one of the many flower farms around Salgaa. He grew unsatisfied with his job at the time and its future prospects. Melchzedeck always had an interest in photography, so, in 2009, he retired from the flower farm and purchased a camera for 4,500 Kenyan Schillings. He had decided to go into business for himself. Three years later, he now owns his own shop selling photographs as well as cell phones, phone cases, phone chargers and other accessories. The shop has a small studio in the back of the shop where Melchzedeck is able to take portraits and family photos. He also operates a kinyozi (barbershop) within his shop in case anyone wants to have a last minute haircut before being photographed. In addition to photographing individuals and families who come into his shop, Melchzedeck also travels to weddings, graduations, birthday parties, and various other gatherings to document the memories as he says. He is one of only two photographers in the village of Salgaa so his services are in high demand. With his next loan, Melchzedeck plans to buy printing machine. Currently, he has to travel to Nakuru to print out the photographs that he takes. Though traveling to Nakuru takes a little over an hour round trip, it is an unnecessary burden as Melchzedeck wants to be able to photograph his customers and instantly present them the photograph. Melchzedeck is optimistic about the future of his business; he rightly views the growth of the population in Salgaa as an opportunity for more weddings, graduations, and every other celebration to be photographed. Posted on November 29, 2012 by Julia Kurnia. This entry was posted in Africa, Cell phones, Kenya, microcredit, Microloan, Microloans, Photographs, update, Zidisha Microfinance. Bookmark the permalink.